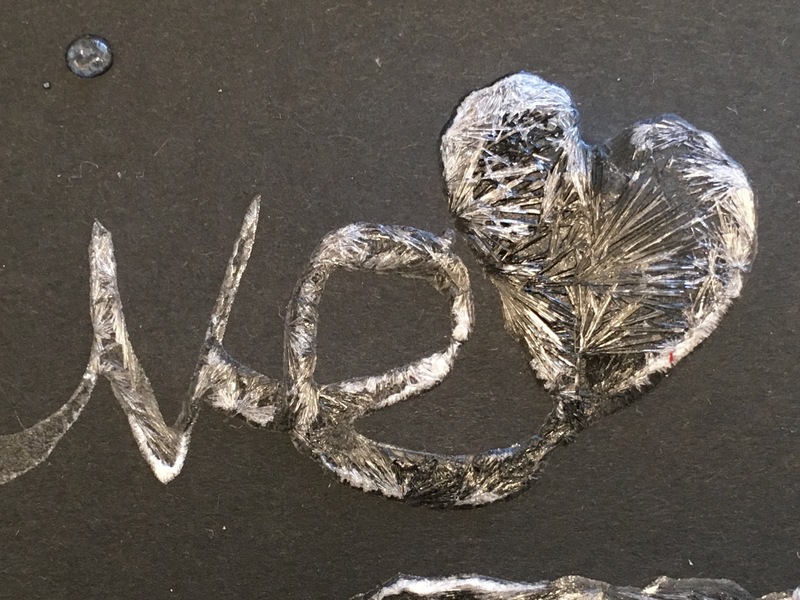 Paint with an epsom salt solution on black paper. 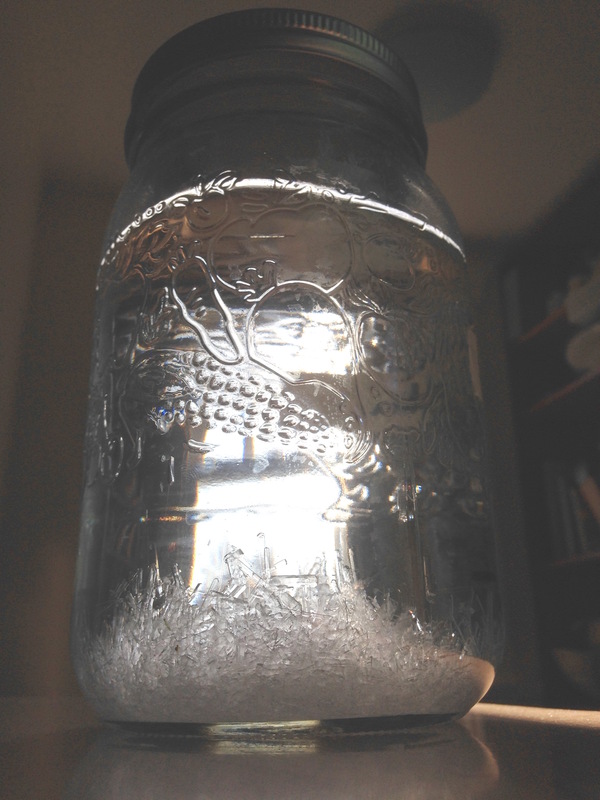 As it dries, long crystals of epsom salt form. Just before the class, make a solution of 1:1 epsom salts:boiling water in a heat proof jar (using half a cup of each per table group). It will take a little while to dissolve all the crystals - heat in a microwave and shake alternately to make a clear solution. Show the students how you make an epsom salt solution. Add a teaspoon of epsom salt crysals ito a jar of just-boiled water, and swirl until they dissolve, using these terms as you do. The salts seemed to disappear, but the molecules of the epsom salts are just mixed completely in with the water molecules. Salt or sugar in water does the same thing. Distribute the 1:1 epsom salt solution to shallow tubs on each table and give each student a piece of smooth black paper and a paintbrush and a flashlight each. 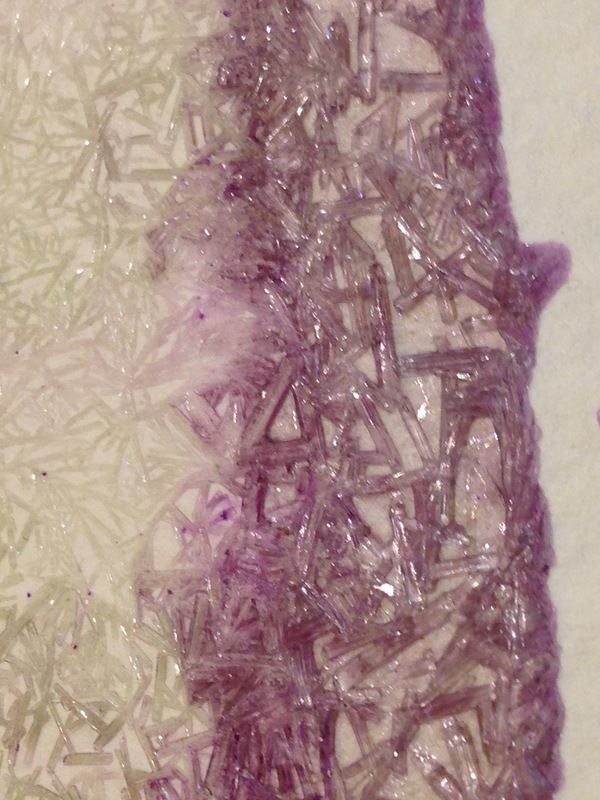 Ask students to paint the epsom salt solution onto the paper. Explain that as the water evaporates from the solution, the epsom salts will be left behind, and will organize themselves into crystals. Small crystals will form rapidly where the epsom salt solution is thin and water evaporates from it fast. In the deeper puddles, the water takes longer to evaporate and longer, spiky crystals have more time to form. Emphasize to students that to make the largest crystals, do not repaint over a wet area, as this will disrupt crystal formation that has already started. 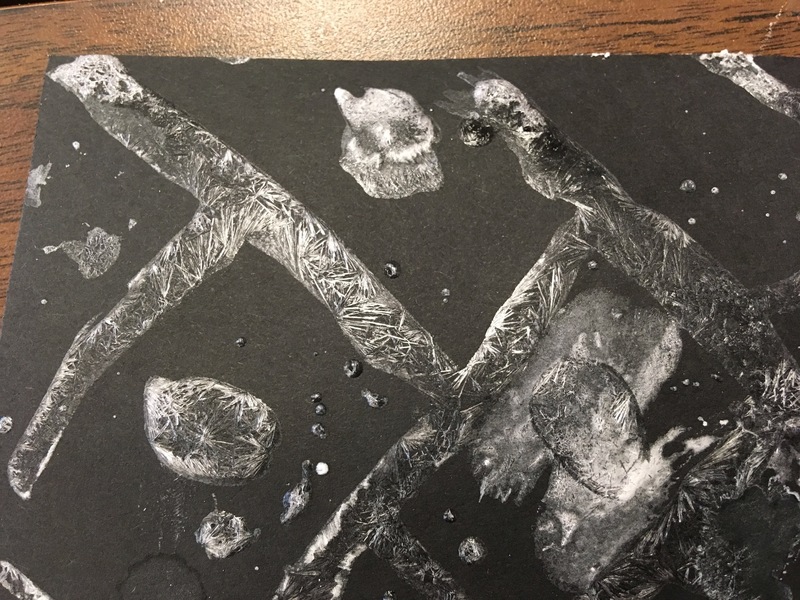 Show students how the flashlights can be used to watch the crystallization process: shine a flashlight sideways onto the paper to see the sparkly crystals, and even see some of them growing as the water evaporates at the edge of a puddle. Students can fill out a worksheet to summarize and reinforce what the molecules are doing during dissolving and crystallization. The crystal shape is technically a monoclinic prism - long with a lopsided, pointy tip. Whatever size the crystals are they will be this shape, but it is only really visible in the larger crystals grown in class or found in the purchased epsom salts. Mix watercolour paints with the epsom salt solution then layer onto thick white paper (e.g. watercolour paper) thickly. Overlapping colours will make nice effects. It will take some time to dry, but is worth the wait. Epsom salts can also be grown in a cup or jar - simply dissolve the epsom salts in the water, and leave in an undisturbed place. A 3-D mass of crystals will form quite quickly. 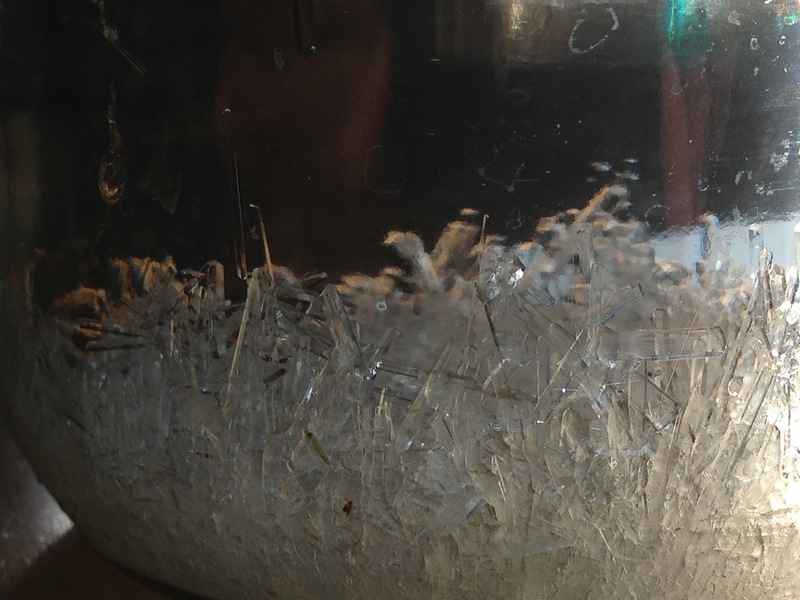 If there are no crystals once the liquid has cooled, tap the jar on a surface to initialize crystallization, and crystals will form very quickly - good to observe. Students use dried beans of different colours to represent water and epsom salt molecules. Older students might be able to place everything around the arrows. Don't like that there is one right answer - how to fix, while getting across what is happening with the molecules?